There are no current published promotions at this time. Reach out to us to see if there is any special pricing that could apply to your next project. This promotion is ideal for current users of Microsoft Dynamics SL, Microsoft Dynamics GP and Microsoft Dynamics NAV that are looking to transition to another Dynamics ERP product such as Microsoft Dynamics AX or Microsoft Dynamics NAV. Why would you want to transition? This transition is ideal for current Dynamics ERP customers who have outgrown their current system. Perhaps you are currently using Microsoft Dynamics SL and have been able to leverage their solid core financials system. If you have extended your operations to include warehousing and manufacturing, then you will need a system such as Microsoft Dynamics NAV to meet those requirements. If you started out on Microsoft Dynamics NAV To meet basic manufacturing needs but operations have outgrown NAV functionality, then an upgrade to Microsoft Dynamics AX would be ideal. What if you are several versions behind? The beauty of this offer is that you can transition to another Dynamics ERP product even if you are several versions behind. This offer is very attractive for companies facing the expense of a major upgrade or switching to an entirely new system. Companies will receive full investment credit for the value of their current Dynamics ERP system to use toward their license cost of their new Dynamics ERP system. 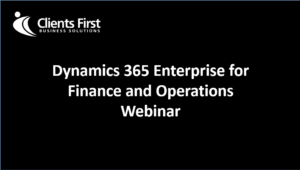 Whether you’re interested in the Cloud or On-Premise ERP, Dynamics 365 for Finance & Operations has your Enterprise covered.